2x4 LED parabolic 18 cell light fixture with 3 LED 18 watt lamps included is an office light that reduces glare and saves energy. It's LED lamps will provide an equal amount of light compared to a fluorescent. The parabolic louver upgrades the appearance of any office area. It's easy to get the LED lighting you want for your space and not have to change lamps for many years. It comes in a choice of light bulb colors making it perfect for any interior color design you might have. Whether you are doing new construction or doing a retrofit of an existing ceiling, this is a good choice for the light control but also for its energy efficiency. And if you're doing some offices in phases, then these will match up well with the existing fluorescents you may be replacing now. This is really a great solution for those of you who want to keep an initial costs down while giving yourself the flexibility of future LED light bulb advancement. You'll be able to change lamps at any time if you want to change the color or if the light output of LED technology improves. And as we've seen over the past several years, that trend continues into more lumens per watt, greater efficiencies and performance. For some people, and that's a lot of you, you want something that's flexible for the future and can accommodate new types of lighting. This is probably one of the lowest cost options we have while still giving you a made in the USA lighting product that has an excellent construction and reliable parts. If you have any questions about how this will perform against other forms of LED lighting products or your old fluorescence that you're trying to replace, just let us know by e-mail or give us a call. - (3) LED light bulbs included. - 50,000+ hours LED lamp life. - Post Powder Paint &get; 90% reflectivity. - Corrosion and scratch resistant. - Louver manufactured from low iridescent semi-specular anodized aluminum. - Protective plastic dust cover keeps louver clean during shipping and installation. - Black reveal provides gap free floating louver appearance. - Hinges from either side. - Positive locking cam action latches. - Access plate for quick wiring. - Recessed inverted T-bar ceilings. Grid mount. - Equipped with Integral Earthquake Clips. - Every fixture is individually tested. - ETL listed for damp location. This is a specialized type of parabolic light fixture because it has the 18-cell louver. It’s one of the many variations you can get today with new LED light fixtures. 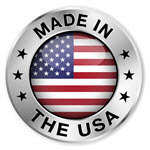 That’s why we make many available types of LED drop ceiling lights that are made in the USA. The build quality is better than the imports, and we have a price that’s very competitive with all of those. There’s never been a better time to upgrade your lighting to something that is not only going to give you excellent illumination but also going to provide you with the least amount of energy use possible. We strive to help all our customers reach those goals when considering a new lighting arrangement. These are the LED lights that replaced the old fluorescent troffers used in the past. These are the ones with the prismatic lens typically and were used for many decades as an effective way to get a good light spread over a larger area. A low cost was always the consideration when specifying this type of lighting. Offices everywhere continue to use this style of drop ceiling grid and will continue to use it far into the future. 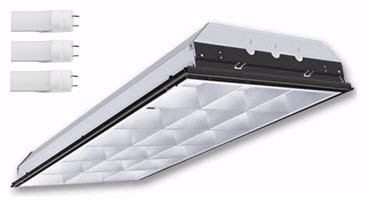 There are several things to consider when replacing a T8 32-watt fluorescent fixture; you need to make sure that you’re going to have enough light with the LED product you’re thinking about choosing. For most type of fluorescents, they can be replaced with roughly half the wattage of LED and still maintain light levels. This is just a general rule of thumb although each situation could be different and it depends a lot on the room that it’s in and what’s being done underneath the light. There are several things to consider when looking for the right light. One of the primary considerations in new lighting is energy savings and how much you can save in real dollars having a good payback for your investment. There’s never been a better time to consider going to something that’s more energy-efficient in 18-cell 2x4 LED troffers because there are so many choices that will accomplish that energy reduction while getting something that looks a little bit better. That’s why we call these lighting retrofits, a lighting upgrade. Because it is an upgrade to getting the best possible lighting for the least amount of wattage is what the game is all about. If you can accomplish that, you win. If you’re unsure as to how much money you can save, we have a simple lighting payback spreadsheet that you can download from the left-hand column of our website. It gives you everything you need to compare an existing lighting system to one of our more efficient LED 2x4’s. Now that we talked about energy efficiency, it’s time to talk about proper lighting. We often say that if you save all the energy in the world, but the lighting job turns out to be poorly done, you haven’t saved anything. Whatever you saved in energy you may lose in productivity or sales if it’s a retail situation. So it’s important to get this done right the first time. We want you to have good lighting while you’re saving a lot of energy. That’s the primary goal, and that’s what it’s all about. If you’re unsure about how many light fixtures you’ll need to get a good lighting job done, you can give us some of the information about the room or rooms you’re trying to light, and we can do a sample layout that will provide you with the necessary lighting for your situation. It’s an excellent way to make sure that what you’re doing is going to fit the task that you’re doing underneath the light as well as the general effect that it will have on the space. Another consideration that people need to take into account when changing over to new LED 2x4 troffers is color temperature. Sometimes people think it’s not that important then they will say that you can give me whatever you feel is best, but we don’t like to do that. It’s an individual choice whether you want something that’s going to have a warmer color appearance or something that’s going to be a cooler color. And a personal preference can reflect on how well office functions. You want to make sure that people are pleased with the color of light if you don’t have that you’ll get people grumbling and may be using it as an excuse for not getting things done. Typically the warmer color is something around 3000K; cool white is about 4100K and daylight is 5000K. Call us if you have any questions about these LED 2x4 troffers or anything else you see on our website. We want to help you get the best lighting possible, and we have many years of reliable expertise working with commercial and industrial customers, retail, home users, electricians and general contractors. We can help you get the right lighting for the least amount of money. We should also say that if you have a more significant quantity that you need to order, call us for an individual quote and will get that to you.